Out on Friday, 'The East' leaves Brit Marling's record of never having been in a bad movie intact. Her second collaboration with co-writer and director Zal Batmanglij after the extraordinary 'Sound Of My Voice', it follows a corporate spy's infiltration of an eco-terrorist collective and her attempt to reconcile her burgeoning awareness of corporate crimes with her life as a protagonist of the establishment. The callous corporate pursuit of profit regardless of the human cost has been the subject of documentary books and films from 'No Logo' to 'The Corporation', but it's much rarer in fiction. The human angle isn't hard to find but it's very difficult to avoid coming across as instantly and impenetrably preachy, which would undermine the point of representing the issue in a story in the first place. 'The East' attempts to circumvent this trap by having Brit Marling's audience-surrogate Sarah, comfortably ensconced in the loving arms of the system, slowly come to realise the extent of mass suffering that the various multi-national corporations - oil, pharmaceutical and industrial - are knowingly responsible for. The eco-terrorists, lead by Alexander Skarsgård's Benji, turn out to be an ostensibly cuddly bunch of misfits, but their idealism is undercut by a streak of personal vendettas that turn the righteous administration of justice into barely concealed vigilantism. When the ante gets upped, Sarah is forced to determine her place in the conflict, paralleled by a romantic choice between her boring but stable boyfriend and the charismatic but obsessed Benji. It's not a perfect movie by any means, I have lots of problems with it. On the technical side, the sound design is patronising at times and often interferes with the film. In emotional scenes and moments of realisation the music has a tendency to kick in as if we weren't expected to know what we should be feeling. A movie that presents a fairly complex subject like this shows confidence in its audience's intellect, so why doesn't it trust us emotionally too? The romantic subplot doesn't add anything to the central concern of the film, and actually pulls focus much of the time. Marling's character doesn't change at all throughout the story: her empathy doesn't increase, her approach and priorities don't change - only the information she's apprised of changes. Her character has no real progression, but the illusion of character progress is sustained by a collateral arc in her evolving espionage career. Despite these faults, 'The East' is still a thrilling movie. There’s a genuine sense that each character, including Sarah, might have something to hide, and Batmanglij is careful to keep things unpredictable. The tension between Ellen Page's Izzy and basically every other character is absorbing, and Toby Kebbell is sympathetic as the collective's eco-doctor. Visually, 'The East' is varied in its camerawork and palette, and contains what look like references to previous Brit Marling movies. A shot of her walking beside a motorway echoes a very similar shot in 'Sound Of My Voice', and shots of her eavesdropping from behind a corner and shivering in a lake are reminiscent of shots from 'Another Earth'. These visual rhymes don't serve a narrative purpose, they confirm a continuity of style and are a cute nod towards fans of Marling's films. Ultimately 'The East' couldn't be expected to resolve the complexities of its theme, but without giving anything away, the ending does implicitly claim to. And it's not a good resolution. In attempting to avoid the tired ideological dichotomy of corporations versus eco-warriors, it plays into the tired rhetorical dichotomy of extremism versus moderation. It trades in one naivety for another, presenting a solution that's neither workable nor conceptually thorough. While this weakens 'The East' as a work of serious commentary, it doesn't detract from its entertainment value. See it for fun and intrigue, but take as much salt as you can with you. 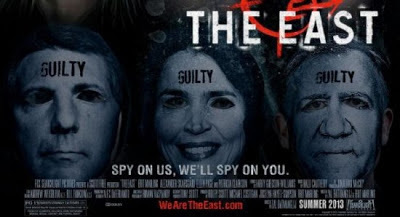 'The East' will be released in UK cinemas on Friday, through Fox Searchlight.